November 19 and 20 marked the debut of the first annual The Feast of Funk and Soul Food festival, held at the Spirit of the Suwannee Music Park. As the title of the festival reveals, this event was not only host to some spectacularly funky shows but also to a menu that alone was worth the three-hour trip from Orlando. With classic southern entrees including prime rib sliders, a Louisiana shrimp boil, and fried chicken ‘n’ waffles, the menu proved to provide an exceptional pregame for mama’s Thanksgiving dinner. Feast of Funk brought in a variety of celebrated chefs from across the South, such as New Orleans’ Crawfish King, Chris “Shaggy” Davis, and Oprah’s former personal chef, Art Smith, each serving up some unforgettable chow. The festival also featured two Florida-based breweries, Dunedin Brewery out of—where else?—Dunedin and 81Bay Brewing Co. out of Tampa. After fueling up on bites and brews throughout the day, everyone was ready to hit the music hall as night fell for seemingly endless funk and boogying. While I am certainly partial in my opinion, I thought Saturday night’s sets rocked the music hall on a whole new level. The Groove Orient, a local Orlando band, kicked off the night with an unbelievable performance—a feat typical of the group. I am a regular attendee of The Groove Orient’s Tuesday shows at Tanqueray’s in downtown Orlando; if you have not attended their Tuesday shows, it is a must to see at least one while you are at Rollins. The show is free, the beer is cheap, and the music is as addicting as the breakfast croissants at Dianne’s. Their most recent Suwannee performance was filled with classic originals, which you can check out on Spotify. They are certainly a crowd pleaser; all five of their members are extremely versatile in styles and instruments, creating an unmatched fusion of sounds. 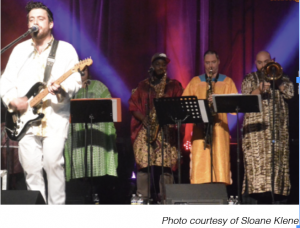 Topping off the festival Saturday night was The Nth Power, featuring esteemed guest artists Jennifer Hartswick, Skerik, Farnell Newton, James Casey, Daniel Sadownick, and Brian Thomas with their passionately delivered tribute to Earth, Wind & Fire. If anyone somehow missed out on getting down on the dance floor before these guys came on, they certainly did not miss it this time; the floor was packed with music lovers old and young alike, all sharing the spice of life. I certainly caught the boogie fever this weekend, so I had a lot to be thankful for when the late-night snacks rolled out as the stage lights went down.